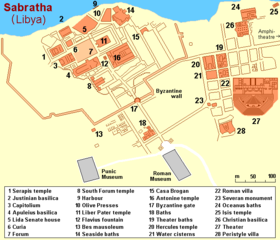 Sabratha's port was established, perhaps about 500 BCE, as the Phoenician trading-post of Tsabratan (Punic: ‬𐤑𐤁‬‬𐤓𐤕‬𐤍, ṣbrtn, or ‬𐤑𐤁‬‬𐤓𐤕𐤏‬𐤍, ṣbrtʿn). This seems to have been a Berber name, suggesting a preëxisting native settlement. The port served as a Phoenician outlet for the products of the African hinterland. Sabratha became part of the short-lived Numidian kingdom of Massinissa before being romanized and rebuilt in the 2nd and 3rd centuries CE. The Emperor Septimius Severus was born nearby in Leptis Magna, and Sabratha reached its monumental peak during the rule of the Severans. The city was badly damaged by earthquakes during the 4th century, particularly the quake of 365. It was rebuilt on a more modest scale by Byzantine governors. The town was site of a bishopric. Within a hundred years of the Muslim invasion of the Maghreb, trade had shifted to other ports and Sabratha dwindled to a village. Besides its Theater at Sabratha [fr] that retains its three-storey architectural backdrop, Sabratha has temples dedicated to Liber Pater, Serapis and Isis. There is a Christian basilica of the time of Justinian and also remnants of some of the mosaic floors that enriched elite dwellings of Roman North Africa (for example, at the Villa Sileen, near Khoms). However, these are most clearly preserved in the colored patterns of the seaward (or Forum) baths, directly overlooking the shore, and in the black and white floors of the theater baths. According to an April, 2016 report, due to soft soil composition and the nature of the coast of Sabratha, which is mostly made up of soft rock and sand, the Ruins of Sabratha are undergoing dangerous periods of coastal erosion. The public baths, olive press building and 'harbor' can be observed as being most damaged as the buildings have crumbled due to storms and unsettled seas. This erosion of the coast of Ancient Sabratha can be seen yearly with significant differences in beach layout and recent crumbled buildings. Breakwaters set in the vicinity of the harbor and olive press are inadequate and too small to efficiently protect the Ancient City of Sabratha. The city is home to Sabratha University. Wefaq Sabratha is the football club, playing at Sabratha Stadium. Sabratha has a hot semi-arid climate (Köppen climate classification BSh). ^ Agence France-Presse (January 31, 2017). "Libyan coastguard intercepts 700 migrants". The Nation. Archived from the original on February 1, 2017. “The coastguard intercepted 700 migrants on board two wooden boats on Friday three nautical miles from the town of Sabratha,” some 70 kilometres (40 miles) west of Tripoli, coastguard spokesman General Ayoub Qassem told AFP. Wikimedia Commons has media related to Sabratha.